We estimate incidence, mortality, and disability-adjusted life years (DALYs) caused by cancer in the Eastern Mediterranean Region (EMR) between 2005 and 2015. In 2015, cancer was responsible for 9.4% of all deaths and 5.1% of all DALYs. It accounted for 722,646 new cases, 379,093 deaths, and 11.7 million DALYs. Between 2005 and 2015, incident cases increased by 46%, deaths by 33%, and DALYs by 31%. The increase in cancer incidence was largely driven by population growth and population aging. Breast cancer, lung cancer, and leukemia were the most common cancers, while lung, breast, and stomach cancers caused most cancer deaths. 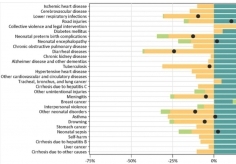 Cancer is responsible for a substantial disease burden in the EMR, which is increasing. There is an urgent need to expand cancer prevention, screening, and awareness programs in EMR countries as well as to improve diagnosis, treatment, and palliative care services.